Taking advantage of a tired Buffalo Bandits team, the Georgia Swarm (6-7) earned a much needed 14-10 win on Sunday afternoon at Duluth’s Infinite Energy Arena. The loss was Buffalo’s (6-7) second of its two-game weekend. 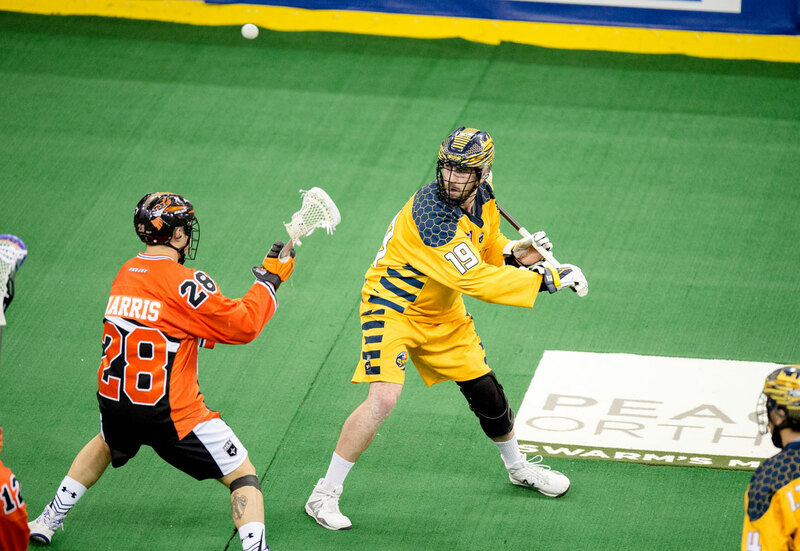 The Thompson brothers opened up the scoring with goals just a minute apart for the Swarm in the first quarter. Lyle Thompson struck first, with Miles quickly following. Kiel Matisz netted another for Georgia before the Bandits could get themselves on the board. Craig England and Mitch Jones added tallies at the tail end of the quarter to bring the Bandits within a goal. But Georgia entered the second quarter with a whole lot of oomph, scoring six goals – including four straight – to jump out to a 9-5 lead at halftime. Again, it was mostly thanks to the sticks of the Thompson’s, with Lyle scoring twice and Jerome adding two of his own. Halftime seemed to calm the Swarm and hype up the Bandits. Buffalo scored three straight goals in the third quarter, including Shawn Evans’ second tally of the evening, bringing them within a goal of Georgia yet again. But who reestablished the Swarm’s lead? Lyle Thompson, of course. His unassisted snipe sent his team into the final quarter up 10-8. Georgia goaltender Mike Poulin was busy in the second half, and the fourth quarter was the best example. After making 12 saves in the third quarter, he successfully pounced on 13 saves in the last frame to hold Buffalo off. Evans found his way past Poulin for his third of the night, but the formidable Swarm offense answered back. Lyle Thompson’s fifth of the game with 4:21 remaining was the nail in the coffin. Poulin led all goaltenders with 43 saves, while Buffalo’s Zach Higgins made 41. The win was exactly what Georgia needed, placing them in a three-way tie in the eastern division with the Bandits and the Rochester Knighthawks for third place. They will take on eastern division leader New England on Saturday. Buffalo ended its busy weekend on a disappointing note, but will look to rebound Friday night, also against New England.